Do you like to indulge in some smooth and creamy eggnog during the holidays? 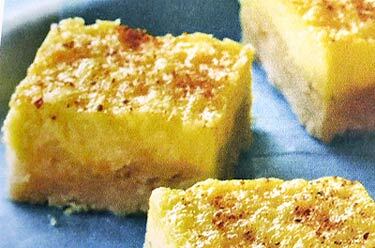 Even if you're not fan, we think you'll quickly fall in love with these easy eggnog squares. The recipe can be whipped up in about 15 minutes and after baking, they will require to cool for at least an hour. Waiting to try these custardy cookie bars will probably be the toughest part! Perfect for the holiday dessert table or neighborhood potluck, these simple eggnog bars spiced with ground nutmeg are sure to delight. Preheat oven to 350F degrees. Line bottom and sides of a 9-inch square pan with foil, allowing foil to overhand on two opposite sides. In a small bowl, mix butter, 1/2 cup sugar and flour until well combined. Press mixture into bottom of pan and up the sides about 1/2 inch. Remove from oven and set pan on wire racks too cool slightly. In a medium bowl with an electric mixer on medium-high speed, beat egg yolks and remaining 1/4 cup sugar until thick. Gradually beat in whipping cream, rum and 1/4 teaspoon of nutmeg. Pour creamed mixture over warm, partially baked crust. Return to oven and make 40 to 50 minutes or until custard is set and knife inserted near center comes out clean. Remove from oven and cool pan completely on wire rack, at least one hour. Sprinkle tops of squares with remaining 1/2 teaspoon nutmeg. Use foil handles to lift bars from pan and cut into 6 rows by 6 rows. Store bars in tightly covered container in refrigerator. This recipe makes about 36 Easy Eggnog Squares. For Whole-Wheat Fig Bars: Substitute 1 1/3 cups whole wheat flour for the 1 1/2 cups all-purpose flour in the cookie dough.